Pictured here is the MOSSAR Color Guard team during the Naturalization Ceremony held at the United States District Court in Kansas City, MO on Thursday, July 14, 2011. A dream for several immigrants was realized Thursday afternoon, July 14, 2011, when they were sworn in as American citizens at the United States District Court in Kansas City, MO. 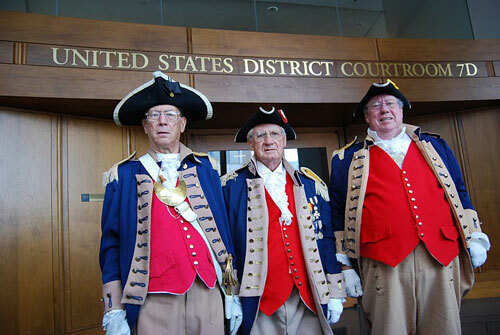 The naturalization ceremony featured a three-member color guard from the Sons of the American Revolution that included MOSSAR Color Guard Commander, Major General Robert L. Grover, Compatriot Bob Lantz, and Compatriot James L. Scott, Western Color Guard Commander. The wife of Compatriot Bob Lantz was one of the immigrants sworn in as a U.S. Citizen. Photo (L-R): Major General Robert L. Grover, MOSSAR Color Guard Commander; Compatriot Bob Lantz; and Compatriot James L. Scott, Western Color Guard Commander.